Weekly Update 2018-43: 90s Swedish pop rock legends The Cardigans, alternative payment for bike food couriers and how to know when you're looking at an abandoned Pizza Hut. Swedish pop rock legends of the 1990s, Cardigans will always have a special place in my heart. Totally male except for a very female lead singer (the prolific Nina Persson), they strike a sort of European No Doubt comparison. This was the highlight of 90s pop rock music for me; strong female lead and poppy music with amusing and offbeat lyrics. In a way, their music is kind of like a cardigan: doesn't take itself too seriously, but still cozy and familiar. I had a really packed weekend, lots of awesome things seen and done. First of all, I checked out Art Spin's Holding Patterns, the art exhibit held in storage lockers to be found all over a self-storage facility in the junction. What a great place for all kinds of art (visual, sculptural, performance, sound, film), even a rogue exhibit by someone who owned a locker and was not part of the exhibition at all. I particularly liked that one. Since it's fall, I went on a nature walk with my parents in Stouffville. There is a lovely network of hiking trails in the woods near a York Region BUILDING. Our tour guide Aileen took us through the paths, showing us the different types of trees and wildlife. She even found two cute red and white mushrooms, and some furry aphids wiggling all over the branch of a tree. My dad enjoying his nature walk. Cute candid pic by the event photographer - my mom, me and my dad! Larissa held her annual Halloween dinner party on Saturday, which is always a great spooky themed evening a nice chance for everyone to test drive their costumes. I am pretty proud of mine, especially the amount of pockets it has. I love pockets. No telling until next week! On Sunday I visited the Israeli Market being held temporarily in the old Sears store in Promenade Mall. It honestly felt just like being in a "Shuk" (or market) in Israel, complete with people yelling at each other in Hebrew and gorgeous murals on the walls by the famous Solomon Souza. 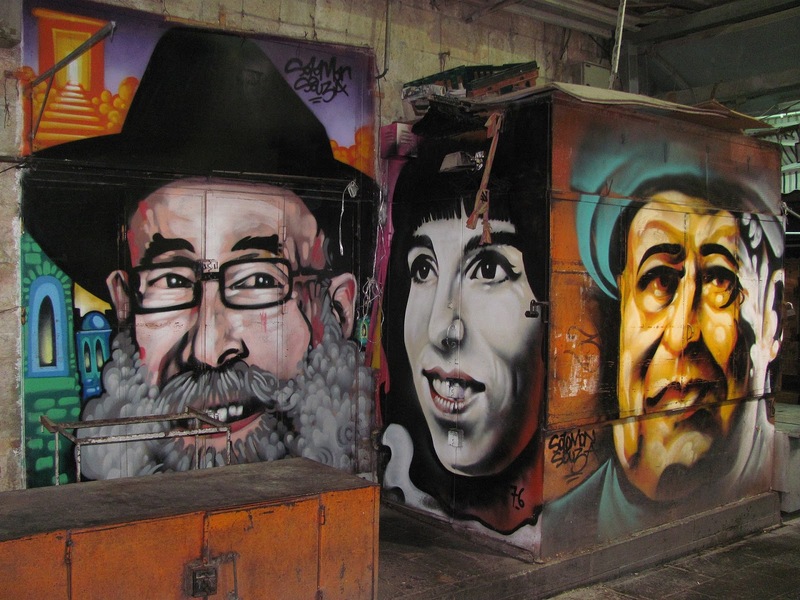 Souza is a mural artist, having created the painted likenesses of over 150 famous Israelites on the garage doors of the stalls in the market. Left to right: Rabbi Shlomo ben David Lakein, Naomi Shemer, and local storeowner. The weekend rounded off with a bit of charity work - my wonderful friend Ann helps to run the Canadian Mesothelioma Foundation, which held a lovely event at the Vaughan Estate to raise money for mesothelioma awareness and to celebrate the passing of a nationwide ban on the usage of asbestos (a main cause of mesothelioma). I helped out by selling raffle tickets for a $15,000 diamond bracelet - it was beautiful but I tried it on for one minute and became very nervous. Congrats to Ann on such a successful event and to her guests for being so generous. By the way, the winner of the bracelet was the LAST man I sold a raffle ticket to. Congrats to you too, stranger! This week I will be teaching my user experience design class all by myself - the lead instructor will be away for two weeks so I get to see how I do flying solo. I will be teaching the students about rapid prototyping and visual design (both things I have a lot of experience with) so I am excited to show them my examples and answer their questions. With Halloween festivities landing on this coming weekend, Toronto Cruisers is holding a spooky group ride on Sunday. My costume lends itself pretty well to biking in theme and comfort level, so I'm pretty jazzed about that. My lower-key goal is to get as much mileage out of my costume as possible - including wearing it to work. I see a lot of food bike couriers around Toronto (mostly as they pass me unsafely with their huge backpack freezer bags) and wonder if their payment is worth the risks they take. I feel I am quite a cautious cyclist (though no stranger to speeding down a hill) and have been lucky not to be hit by a car. Because of the danger, I wonder if there is a business model for bike meal delivery that makes it more worthwhile than a simple monetary payment. What if delivery-people were paid in taking bites out of the food they delivered? I love to bike around and sometimes I just want a snack but I have no idea what to choose. I'd treat the whole vibe totally differently, though, by incorporating biking for joy rather than speed since there's no money involved. Honestly, this could be the next startup idea of the century. 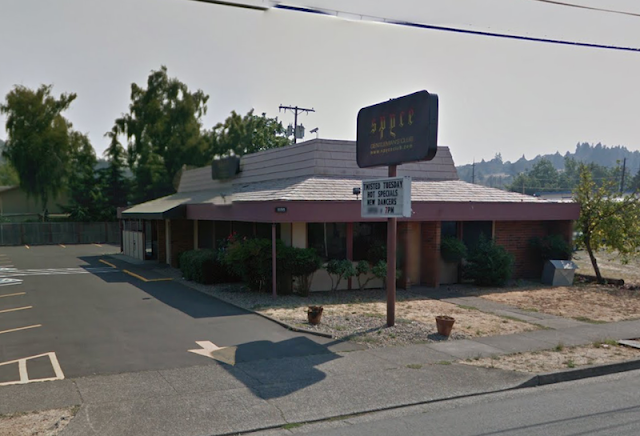 Spyce Gentlemen's Club in Eugene, Oregon. Does its shape remind you of anything? 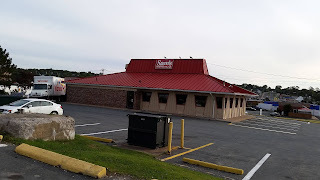 Yes, it's a blog totally dedicated to current tenants of establishments that once housed the almighty Pizza Hut. Having been purpose-built with the iconic architectural "hut" red roof, these establishments will forever stink of the figurative and literal cheese grease that once graced their land. I love the idea of reusing on the smaller scale of my own life, so why not adore it on the scale of a building? Yes, Pizza Hut does generally like to pronounce its arrival in your neighbourhood with a very identifiable building shape. And when it eventually leaves your neighbourhood and your heart, it leaves behind that identifiable building silhouette, only to be taken up by some new sorry tenant who will never be able to remove that smell completely. It's a visual reminder of cheese grease from a time long passed. The make-your-own sundae bar is long melted and the Skor bits are all gone. The untouched decorative kale on the salad bar has wilted away, but the red hut remains. The author adds charming little anecdotes about the buildings and their current tenants, which I implore you to go and read. Check out the blog in all its glory. Weekly Update 2018-42: Oktoberfest ist wunderbar! I visited Kitchener over the weekend for their annual Oktoberfest: Polka King Walter Ostanek, Miesbacher Hats and the beautiful Altes Muenchen Haus. If there's one kind of music that is severely underrated, it's Polka. Never have I witnessed such consistently happy music as the genre of Polka, it just makes you want to dance. And on top of that, the style is quite forgiving, even perhaps demanding, of silly dance moves. While Polka music has its roots in 19th century Bohemia (modern day Czech Republic), Canada has its very own Polka King Ladislav John "Walter" Ostanek. I have seen him play once before at Beau's Oktoberfest in 2014, and I was delighted to see him again at the Altes Muenchen Haus in Kitchener on Saturday night. I've never had so much fun doing the chicken dance in my whole life. Check out Ostanek's wide discography on Spotify. While Kitchener is just over an hour's drive away from Toronto, my car-less lifestyle meant I would be taking the GO train on Friday night. I didn't realize that the train would be packed from having just passed through Union station at rush hour, but I managed to find a seat anyway (possibly the last one in the train car). Unfortunately I didn't get over to the Railpath this summer to bike along the trail, but I got to see some of the awesome graffiti on the train ride. I don't know why spray-painted tags on train lines are so beautiful and interesting to look at, but they just are. Over a two-hour train ride (that slowly emptied until I was the last one in the train car), I managed to write a blog post, eat a full dinner, watch an episode of Ozark, and do one of my physiotherapy stretches. The other passenger in the car during my stretch seemed confused as to what exactly I was doing. 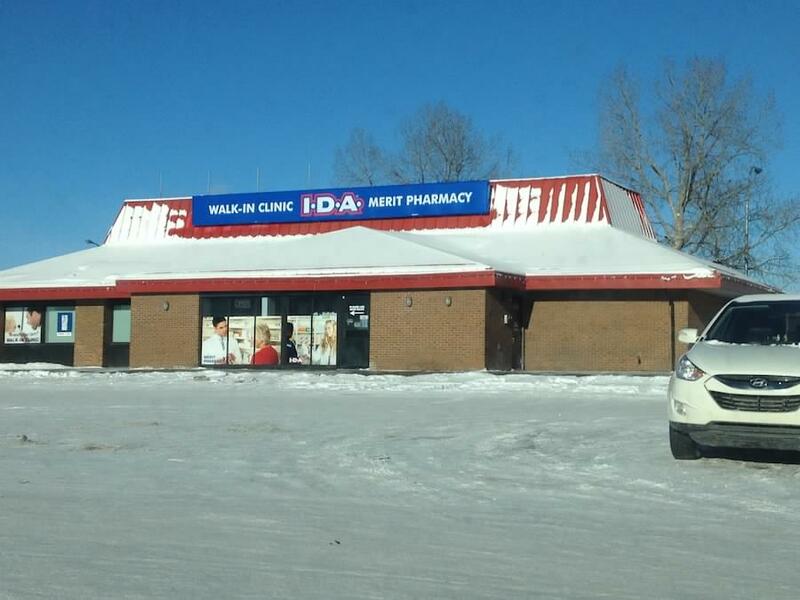 It probably looked pretty weird. And of course, Oktoberfest was the main goal of the weekend, which I think we accomplished pretty well! Kaylin did an amazing job of picking two equally cool events - one modern at a shiny new event space and one classic at an old skating rink with wooden rafters. It was an amazing weekend, and we even spotted Uncle Hans at the Friday event! In case you didn't know, he is a huge orange mascot man that we kept missing last year - he moves from event to event very quickly for a man of his age and size! Hans onstage at Oktoberfest Haus, helping to tap the keg. And on top of that, we also visited a squash farm! There were so many cool kinds of squash, a corn maze, a bunch of animals to pet and fawn over, and even tractor rides. Here's Kaylin looking extremely cute. Kaylin looking cute with her various squashes. This week I want to make an enchilada casserole from a recipe I found a couple of months ago. I always feel like Fall is the perfect time to eat casseroles. I'm also hoping to check out another project by Art Spin (creators of the Toronto Island Bike Art Crawl this summer). This one, called Holding Patterns, takes place in a bunch of storage lockers at Dundas and Dupont, all sorts of weird and wonderful mini-exhibitions. I can't wait to check it out. A wonderful tradition of Oktoberfest is the alpine or Miesbacher hat. 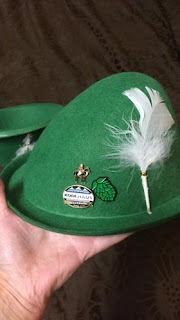 This is a traditional German hat worn for the holiday, usually adorned with a feather (the bigger, the better) and a pin collection that displays the wearer's past Oktoberfests, hobbies, favourite breweries, etc. It was really awesome to check out other people's hats and see their collection of pins - especially so since many of them are my beloved enamel pins. I love that the town lives and breathes Oktoberfest, even outside of festival time. There's so much wonderful German heritage to be found in the town, and it's been there so long that you can find pieces of it in thrift stores. The newer pins are certainly lovely, but the vintage ones are charming on a whole different level. I was so lucky to be able to attend two Oktoberfest events this year. Friday night at the Oktoberfest Haus boasted a shiny new event venue made out of an old warehouse, complete with a visit from Uncle Hans himself and a traditional keg-tapping demonstration in front of a huge, drunken crowd. It was definitely fun but Saturday night at the Altes Muenchen Haus was the shiny star of the show. It really reminded me of rural Ontario agricultural fairs on de-iced hockey rinks. Which is exactly what Altes Muenchen Haus was - in an old hockey arena. I loved the vibe of the whole thing - from the colour-coded sports lines painted on the floor to the old banners for the different states of Germany...or whatever they were. I especially loved this banner of Uncle Hans and his wife Frieda from the earlier days of Kitchener Oktoberfest. It's so kitschy and wonderful. In addition to Walter Ostanek gracing us with his whimsical Polka all night, I managed to scarf down a huge plate of schnitzel and cabbage rolls. It was a lovely evening. Schnitzel always tastes better at Oktoberfest. Weekly Update 2018-40: Early 21st century folk music finds a home in Dark Was The Night, why dynamic calendar app icons are the expected standard and the self-reflective early street photography of Vivian Maier. This one takes me way back. Not so much a band as a special compilation released to benefit HIV/AIDS research, this 2009 double-CD album packs in no less than 31 tracks by some of my absolute favourite folk rock artists. The title is derived from the Blind Willie Johnson song "Dark Was the Night, Cold Was the Ground", which is covered on this collection by the Kronos Quartet. The album is a beautiful and thoughtful attempt to capture a musical renaissance, which may not have the cultural impact of grunge or punk, but is equally significant from a cultural and creative standpoint. These artists are not fringe or marginal: Feist, Grizzly Bear, The National, Sharon Jones, Kevin Drew, Arcade Fire, I could literally name anyone on the tracklist. Take a listen and be transported to a moody, rainy Sunday back at the end of the last decade when things were a bit simpler. I have been trying to get out to Hamilton pretty much this entire summer, and finally made the journey last week. We got some amazing food on Locke Street including a delicious blueberry honey donut from Donut Monster and some delightfully fall-inspired parsnip and pear soup. The main event of the day, though, was to visit the Art Gallery of Hamilton to see the only Canadian stop of a tour of Vivian Maier's impressive collection of photography. More on that in the inspiration section below! Since one art gallery wasn't enough, I managed to get myself to the AGO two days later to see Edward Burtynsky's Anthropocene exhibition of photographs depicting the ways humans are using technology to reshape our planet on a massive scale. My eyes were opened to many practices I had not previously known about, such as massive deforestation in Borneo for the farming and production of the world's supply of palm oil (found in almost every man-made product) to the burning of confiscated elephant tusks in Kenya (actually a statement against the poaching of animals for their ivory). The exhibition is on until January 2019 so you still have lots of time to see it for yourself. 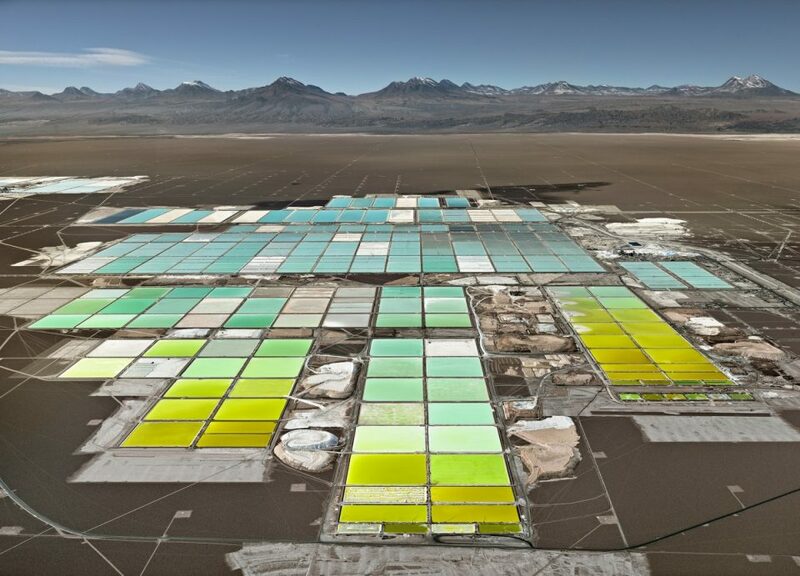 Burtynsky's photo of lithium ponds in Chile - with the growing need for rechargeable batteries as we move away from fossil fuels, lithium may become the most in-demand resource of this century. Last but not least, I voted! Yes, I was able to drag myself up to Richmond Hill for an advance poll this weekend. I always make a point to vote, but in addition I sat down with my family to do some research on the candidates and make an informed decision about who we want to act as mayor over the town. Now, more than ever, being an informed citizen on the socio-political landscape is one of the only ways we can have our voices heard about the powers that control many aspects of our lives. I do urge you to vote on Monday October 22. This week brings much change! I start a new job on Tuesday, and I am going to treat myself to a visit to the Bunz Flea after work to do what I do best: trade all my stuff away. I have lots of trades already pre-set for the event, but it's always fun to see what I might possibly be able to trade with vendors on the day of. It's really one of my favourite events of the year. Hope to see you there too! 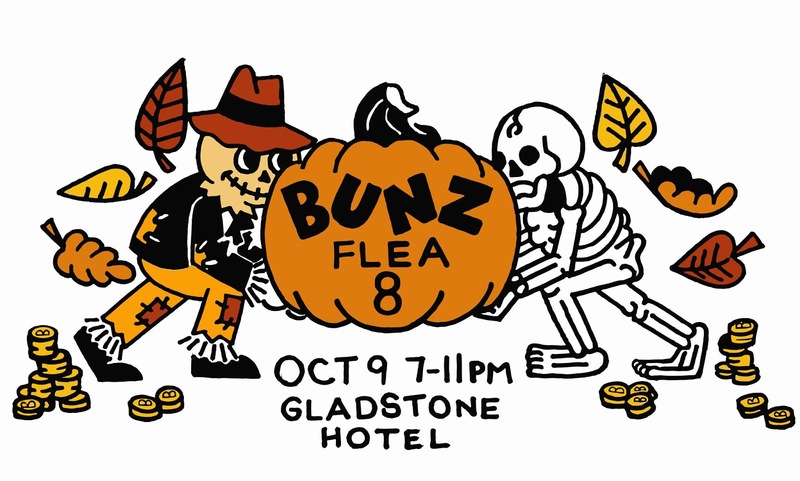 The Bunz Flea is happening on Tuesday October 9 from 7-11pm at the Gladstone Hotel. Having been a heavy user of Google Calendar on multiple devices for the past four years or so, I am in constant disbelief that the app doesn't automatically update its app icon to reflect today's date (like the native Apple Calendar does). It's such a small detail but something that would improve the user experience so, so much. 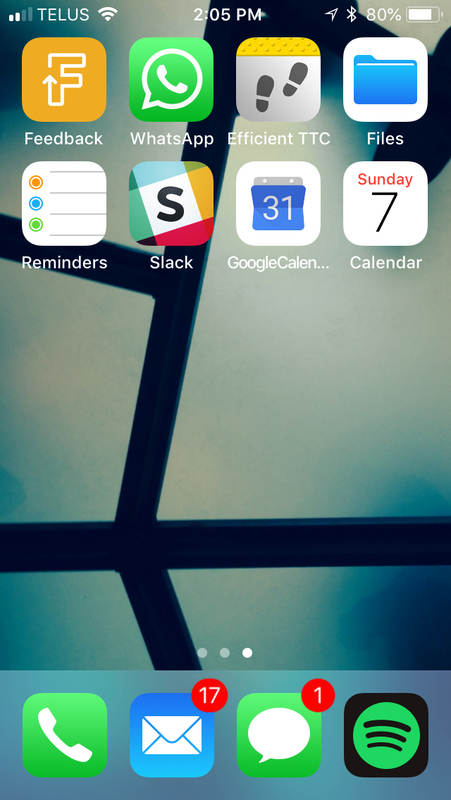 One calendar icon is useful, while the other...isn't. Upon doing a bit of sleuthing, it appears that Apple's API for app development does not provide the ability for apps to change their icons in any non-manual way. Of course, the Apple Calendar and Clock apps are the exception since they were made by Apple. How dastardly! And what does Apple even do with all that power? They certainly didn't waste it on the Weather app icon, which could surely have benefitted from the same treatment. I think the idea is a good one, and if Apple obviously sees the potential, I feel it is their duty to allow these sorts of updates to their app developers. Oh well, as they always say, a broken app icon is still correct seven days a year. 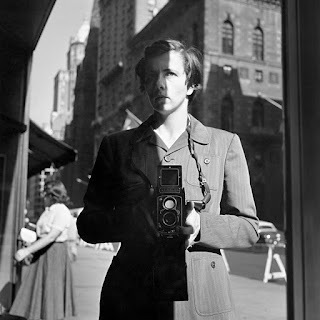 Dubbed the “secret nanny-photographer”, Vivian Maier (1926-2009) always had a Rolleiflex camera around her neck, yet zealously hid the resulting photographs from others. Her work included more than 2,000 rolls of film, 3,000 prints, and more than 100,000 negatives, yet she remained unknown until her street and travel photography was discovered at a Chicago auction house in 2007, when the contents of one of her storage lockers was sold off to cover delinquent payments. 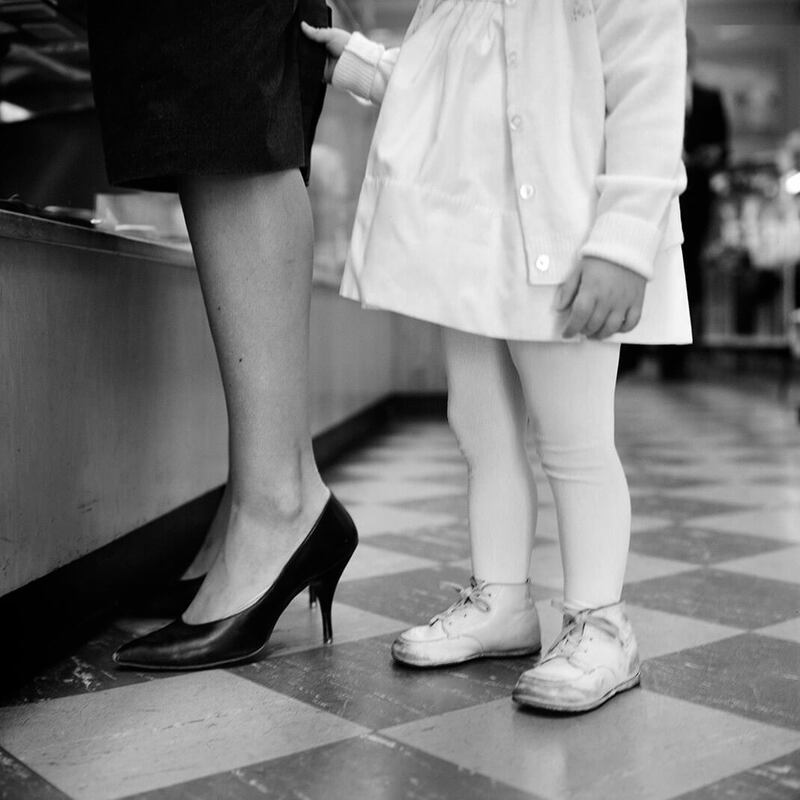 In the ~100 selected pieces of her body of work on display at the AGH, her talented eye for layout and composition in photography is immediately apparent. I personally enjoyed her earlier black and white works, but in later years she also showed a talent for colour imagery. To have been a street photographer in the earlier part of the 20th century must have been something of a wonder in itself, Maier's ability to capture momentous candid shots of strangers seems at least in part due to the fact that her subjects may not have been familiar with photography and her camera, which she held at chest height as she snapped her shots. Self portrait in the reflection of a store window. October 18th, 1953, New York, NY. 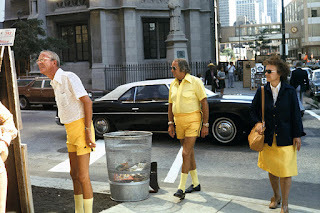 Untitled, Chicago, IL, August 1976. The exhibition is on until January 2019, alongside many other very interesting works at the Art Gallery of Hamilton. And while you're in the city, why not get a delicious donut as well? It's a great day out. Weekly Update 2018-39: The smooth voice of Bahamas, wondering why we must shorten the long-form writing style and tapping into Toronto's sharing economy for a fall cleaning. Afie Jurvanen, a musician from Barrie, Ontario, is quite a wonder. He is self-taught on guitar, has a voice like soft velvet, and is an amazing songwriter. He makes the perfect wind-down music, it's really calm and satisfying. Bahamas is also extremely solid as a live performer; I have really nice memories of seeing him on a sunny WayHome field while playing under a giant parachute, and a free show on an ice rink by the lake last winter. It just works for all occasions! Honestly, start anywhere. You'll fall in love, just like I did. We had our family Garage sale last weekend, selling off about 40% of the items which was pretty good considering the sheer volume. It was a lovely weekend with family, and a hobby whose process I think we all really enjoy. The true accomplishment (and #1 goal for me) was to get these items in the hands of people who will use and enjoy them, so in donating most of the remainder I hope they will get some further use. Some of the items went back into the sharing economy with the help of Bunz, clothing swaps, and flea markets. See the inspiration below for specifics! Autumn is definitely a time for change because I have not one, but two new jobs. Yep, I've already started a new part-time position as an associate instructor at BrainStation in their user experience design department. Honestly, after only one class, I am really enjoying the position. The staff are all really helpful and friendly, and the students all actually want to be there and participate. It's really great. I hope we can keep up the enthusiasm for the next 9 weeks! A personal best for me, I managed to stay awake until 4:00am this past Saturday for Nuit Blanche, the annual art-based sunset-to-sunrise city takeover. To avoid lines, crowds of people and the cold of the night, I decided to tag along with Toronto Cruisers and check out the city by bike. Not to mention that biking in groups is always the best way to get around a crowded city. We all dressed up as skeletons and looked very spooky on our glowing bikes. Ashleigh looking very spooky with a crow on her handlebars. Apparently the Sukkot Geofilter has been somewhat popular and I got a referral from it! Yes, apparently weddings are also a popular place for a custom Geofilter, so I'll be working on that this week. 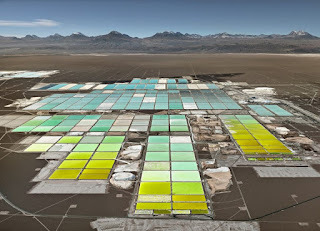 I also managed to squeeze one more free special exhibit admission out of my year-long AGO membership, so I'll be seeing Edward Burtynsky's Anthropocene this Friday. It involves some sort of augmented reality exhibit, which I'm pretty excited to see. In this technological age where we prize instant gratification over delayed and refuse to choose the right way over the easy way, a colloquial term has arisen to poke fun at this behavioural turn: TLDR. Short for "too long, didn't read", this term depicts the flippant way in which many people refuse to put the hard work in for a meaningful outcome. 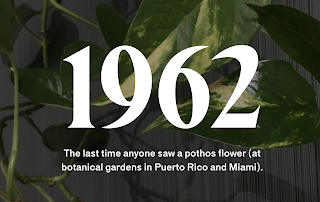 I see it most commonly stated in regards to long-form articles, since people generally prefer to absorb (or at least scroll through) information at the quickest possible rate. Move down past the whole article and at the bottom, a miniscule TLDR warmly greets you in the glow of its glazed-over synopsis of the carefully worded and structured article above. Why bother writing (or reading) the original article at all if you'll simply finish off with a TLDR? I choose to write long-form (though arguably this is more like medium-form) because I use the method of writing to decipher thoughts and feelings. The TLDR would totally miss the point of what I actually do with my writing. I suppose I find the reduction of ideas into a summary allows the reader to be lazy, and doesn't offer the whole picture of how an idea was reached. It's just like design, where the process and journey are just as important as the outcome. All of that said, we can do our best to write succinctly and in a way that invites the reader to enjoy the journey. 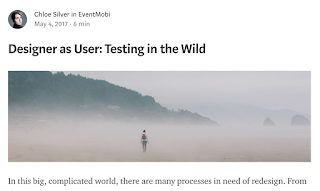 These are user experience choices we make in our authorship, such as the choice Medium makes to display the reading time at the top of an article. We prime our readers on the length before they invest too much, so that they know what to expect. Readers can decide if they want to spend 6 minutes on me before they begin reading. I suggest that instead of providing an easy, cheap alternative to the challenging route, we learn to celebrate the journey of growth by priming our users and helping them along the less-trodden path. Living in a mid-sized city, I am constant delight of the way my fellow citizens reduce their carbon footprint every day. As you know, I hosted a garage sale last weekend in an attempt to give some of my overlooked possessions a new lease on life with someone who will use them. Having sold only 40% of the items, I managed to find quite a few outlets for the remaining items. 4) Secondhand Sunday in numerous neighbourhoods and happening twice annually! 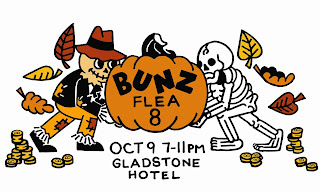 5) UPCOMING Bunz Flea #8 at the Gladstone Hotel - Tuesday October 9! For some sick, sad reason, we often become tired of clothing (and other items) long before it has worn out its purpose. Therefore the sharing economy is perfect for trading these items and resetting their "new, to me" value. Not to mention, it's amazingly good for the environment, allowing us to use up some of the excessively made manufactured goods we have just sitting around. It's one step closer to a happier, healthier world. Imagine if we could all choose to live on the items we already own, without acquiring a new item (beyond food and consumables) for a whole year.